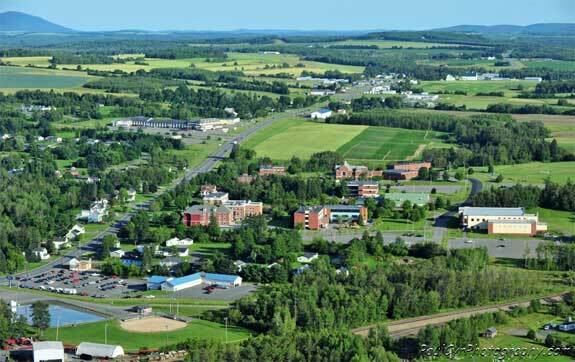 Presque Isle, Maine is Aroostook County's largest city. As the largest city in Maine’s biggest and northernmost county — Aroostook — Presque Isle and its neighbors, Ashland, Blaine, Castle Hill, Chapman, Easton, Mapleton, Mars Hill, Masardis, Oxbow and Westfield, draw visitors year-round. This scenic area is home to a range of cultural, historical and recreational attractions, from museums to planetariums, ski resorts to nature preserves. Presque Isle’s history stretches back to 1838, when it was founded by Dennis Fairbanks. However, the town’s – and much of Aroostook County’s — proximity to Canada soon led to border disputes, which in turn blew up into the Aroostook War. When the confusion was resolved in 1842, the Presque Isle region grew, thanks to burgeoning lumber, agricultural and milling industries, and became an important center of trade. In 1903, the Aroostook State Normal School was founded; now known as the University of Mane at Presque Isle, the college has 1,500 students and is home to the Northern Maine Museum of Science, which contains natural history and scientific exhibits ranging from pterosaur fossils to Maine’s northern lights. The University also operates the Aroostook Farm Maine Agricultural and Forest Experiment Station; this 425-acre farm houses a series of labs, barns and greenhouses that help agricultural scientists work on issues related to Maine’s potato growing industry. Presque Isle even has its own airport; in 1941, the Presque Isle Air Force Base provided a base of operations during WWII and the Korean War. The base now serves as the Northern Maine Regional Airport. The region’s aviation past comes to life at the Presque Isle Air Museum. Housed in the airport’s terminal building, the museum contains displays and exhibits that commemorate those who served at the air base. Other historical sites include the Mark and Emily Turner Memorial Library. First established in 1908, the library is housed in its original building and has a collection of more than 60,000 items. Learn more about the region’s rich history at one of the Presque Isle Historical Society’s project sites. The society maintains the mid-18th century Vera Estey House, a 1940s-era fire station and offers historic city tours on Molley the Trolley. For a taste of local culture, stop by the Wintergreen Arts Center. This downtown non-profit offers a regular schedule of art classes, workshops and events. Educate yourself at the Francis Malcolm Science Center in nearby Easton, Maine. The center offers a range of science exhibits, interactive displays, classes and events for all ages; visitors can even stroll or snowshoe on the center’s grounds. At the end of July, the annual Northern Maine Fair celebrates the region’s rich agricultural traditions with animal shows, competitions, carnival rides, harness racing, fireworks, food and live entertainment. August visitors won’t want to miss the Crown of Maine Balloon Fest. Every year, this colorful festival decorates the skies in commemoration of the first successful transatlantic balloon crossing, which launched from Presque Isle on August 11, 1978. Aroostook County is known for its scenic wilderness and diverse recreational opportunities, and Presque Isle’s location at the edge of the great North Maine Woods makes it the perfect jumping off point for outdoor adventures. A great place to start is Aroostook State Park; this 800-acre park contains Quaggy Jo Mountain, Echo Lake, camping sites and miles of hiking, biking, cross-country skiing and snowshoeing trails. Presque Isle is also popular amongst paddlers; it offers access to the Allagash Wilderness Waterway as well as the Aroostook River and Presque Isle Stream, perfect for canoeing and kayaking. Other popular recreation destinations in the region include Socopan Lake and Arnold Brook Lake and Recreation Area, both known for their excellent fishing and boating opportunities. Find the perfect souvenir of your Presque Isle vacation at the Aroostook Centre Mall; it’s got more than 30 shops and a food court. The streets of downtown Presque Isle are also lined with an eclectic mix of boutiques, art galleries, eateries and antique shops. The local chamber of commerce offers a free walking tour of the city from spring through fall. Visitors to Presque Isle can take their pick of accommodation, from tiny bed and breakfasts to national hotel chains, mom-and-pop motor inns to cozy lodges. There are also a variety of restaurants across the region to tempt your palate, from casual cafes to gourmet eateries. While you’re in the Presque Isle area, spend an afternoon or two exploring Mars Hill. Named after Hezekiah Mars, a Canadian that camped at the bottom of Mars Hill Mountain for three years. This little town is packed full of outdoor recreational activities, from winter skiing and snowboarding and fall foliage chair lift rides in autumn at Big Rock Resort. Golfers can play the 18-hole course at Mars Hill Country Club – it’s open to the public – and New England’s second largest wind farm perches atop Mars Hill Mountain, complete with its own live mountaintop webcam. Visit the following directories to find lodging, dining, attractions, shops, services and recreational activities in the Presque Isle, Maine area.